The Gods that fill the tales of Greek mythology are essentially ancient superheroes. The old statues, frescoes and wall paintings are like comic books. 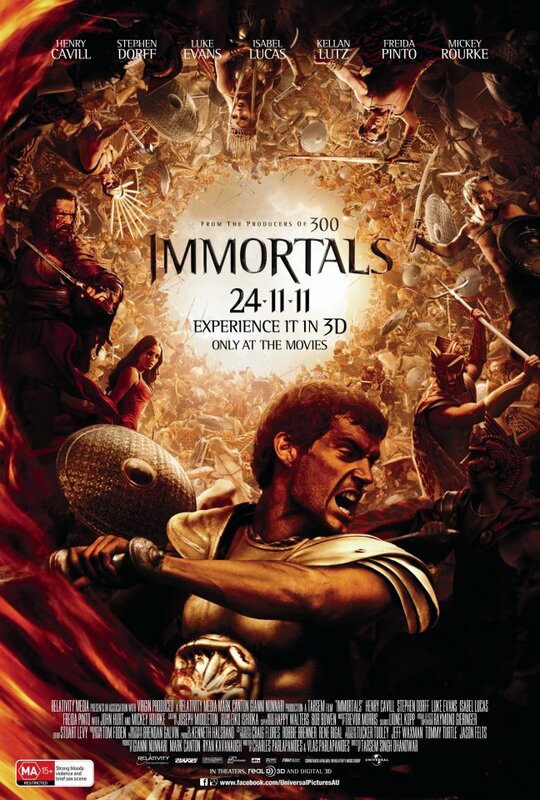 ‘Immortals’ brings those old artworks to life beautifully but any notions that this film is anything more is a myth. The ruthless king Hyperion (Mickey Rourke) is on a quest to find a powerful weapon that he plans to use against the Gods and destroy them. When Hyperion’s army ravages a small town, a local peasant Theseus (Henry Cavill) is called upon by the Gods to fight back. ‘Immortals’ is a feast for the eyeballs and director Tarsem Singh carefully crafts every shot to look exactly like one of those ancient Greek paintings. I can imagine retailers around the world using this film to showcase their latest range of high definition televisions when it hits Blu-ray. Making the visuals really pop is the action, and when I say pop, I’m talking about people’s heads! ‘Immortals’ is violent and bloody but it matches the setting. One of the film’s highlights is seeing the Gods cut loose in battle and doing their best impersonation of a meat slicer. With so much effort being put into the visual side, it’s a shame no one paid any attention to the script. The plot lumbers from one battle to the next and all the characters are one dimensional. The acting is pretty hammy with Rourke putting himself out there for another career slide. Cavill does well as the action man and cuts the perfect frame as a Greek warrior but there is not much for him to do besides impaling bad guys. ‘Immortals’ is like visiting an ancient Greek exhibition at a museum; you marvel at the relics for a short time and move on. I’m on the same page. Some pretty incredible battle scenes, and gorgeous visuals, which had me in a state of awe on occasions. But, nothing else is done very well at all, leading to no replay value. It’s cool for a bit, and you share a “how crazy was that?” with friends, and then it’s long forgotten. Honestly, I want to see this film for the visuals alone, Tarsem is a master in that category. Nice write up!